It was just one of those days. I’m sure we all have them, but at the time I was asking “Why me?” I had an observation by my manager in 10 minutes, relatives arriving the next day and an apartment to clean before they got there. My local driving licence had also expired, and I was well aware that the local constabulary were full swing into their pre-TET revenue raising antics. It was critical I get the transport office the next day and pick up my new one. So ….when my tooth broke in half, I was not a happy girl! 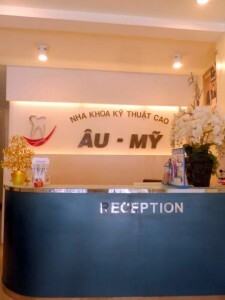 Finding a reliable dental clinic in Saigon had NOT been on my to-do list!!! As with most things in Vietnam, the best services are found by personal recommendation. Thankfully a fellow teacher had a similar problem recently and had followed up on a suggestion by a seasoned expat. With nothing to lose, I appeared on the doorstep of Au My Dental Clinic at ten the next morning. Broken tooth in hand, I tentatively entered, not knowing what to expect. We’ve seen some pretty medieval dental services in our travels so understandably both Tim, and I avoid the dentist like the plague. That’s probably one reason I had the problem now. But while I’m not entirely phobic, childhood memories of the Dentist’s drill were surfacing from my subconscious, resulting in an icky feeling in the pit of my stomach. In my opinion, anyone who enjoys having multiple steel objects rammed into your mouth, being jabbed, drilled and prodded while being told to relax is one sick puppy. Ok. First impressions were good. A smiling receptionist informed me I could get in to see the dentist straight away. She summoned a dental technician who carefully examined the broken tooth as if she knew what she was doing (not that I’d know!). Within 10 minutes, I had been ushered into clean, modern facilities with all the mod cons I remembered at home. Degrees and diplomas from the USA adorned the walls along with several beaming pictures of the lovely lady, who would be my dentist. A quick, professional examination confirmed my suspicions. A filling just wasn’t going to cut it this time. There was too little tooth remaining. It would need to be a crown. My dentist ran me through all the pricing options. She would provide me with a temporary filling immediately and take the necessary x-rays and moulds to build a crown. I could choose the top of the range ceramic for 4.5 million or take the cheaper metal option for 2.5million. The temporary filling would be 400 000 VND, another smaller filling I hadn’t got around to (read putting it off!!) would be 300 000 VND. Total price including a well overdue professional clean, 5.5 million VND. Approximately $270 USD. I’m not sure what it costs you to visit the dentist in recent times, but last time I went for a check-up and small filling, the bill came to $130. I believe a crown would be in the thousands. We’ve met more than one Aussie, who has made the trip to Saigon to receive dental care. They can have high-quality work performed AND an all-inclusive holiday for less than the price it would cost them t have the same job back home. 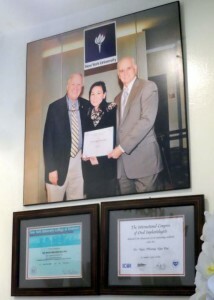 It was also far cheaper than the big International clinics I have previously recommended. Three visits and one week later, I’m now the proud owner of a well-fitted ceramic crown. The treatment was extremely professional and as caring as a dentist can be. I was very happy with the cleanliness of everything. As a former microbiologist, I can spot a properly sterilized instrument pack a mile away. Staff wore masks, gloves and safety glasses as appropriate. The dentist speaks adequate English to communicate clearly. There were no surprises at the end of the treatment. 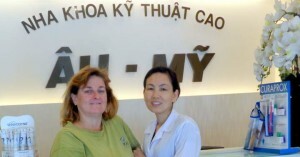 Everything was exactly as promised and included a follow-up check to see everything was OK. On my last visit, her American-Vietnamese partner (who just happens to be an ophthalmologist) took the day off to come and chat to ensure I was happy with her work. Wow! That’s service. So now I’m more than happy to add my personal recommendation to the growing list of Expats that list Au My as a well-priced, professional dental clinic in Saigon. I just have to get Tim there for a check-up before we head off on our next adventure. Wish me luck!! PS. I just thought I’d add in one of our scarier pictures of dental practices around the world. Now you know why I was so relieved! 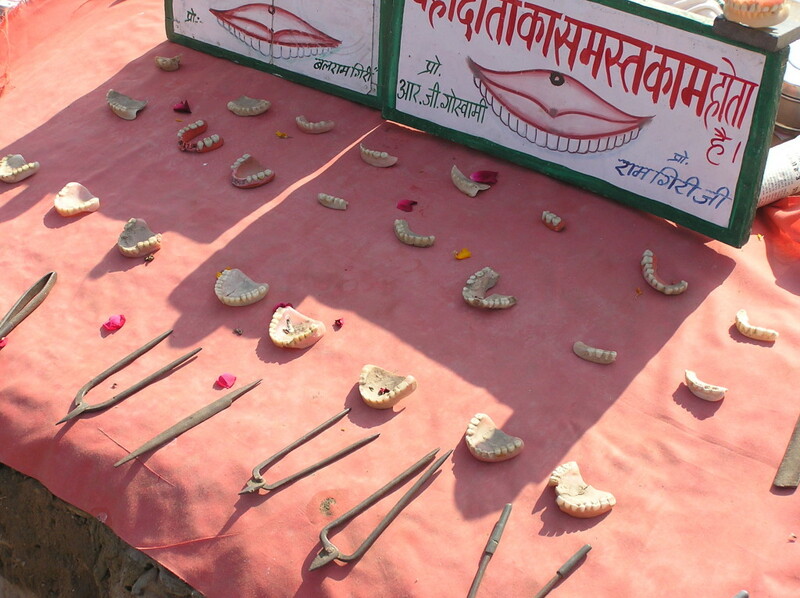 Dental tools spotted on our 2004 Indian adventure! Previous story The Sharks Made Me Do It! M2C Cafe in Saigon. Definitely not the owner Paul. I’m an Aussie who just happens to spend a decent amount of time in HCMC when I’m not travelling around the world. I just broke my tooth, got recommendations from 2 colleagues and had a good experience. I find it’s always better to go from personal recommendations on these kinds of services so decided to write about it…None of my blogs or recommendations on this site are paid unless I put a rider in to say what I’m getting out of it. Eg. If you get a visa through my links or buy World Nomads travel insurance I get a small commission…but you still pay the same price than if you found the site by yourself. I’ve said that on the page…The small amount keeps the site going so I can keep providing good info for visitors to one of my favourite cities in the world.